There are certain tools that every Show Manager should have at their disposal to simplify tasks. From organizational apps to coffee (never underrated), these things help make your job easier. There is nothing wrong with simplifying things in order to be more efficient…so long as it’s equally effective. When it comes to your business it’s OK to simplify things. You won’t win any awards by making things needlessly complex. Analyzing trade show performance can leave anyone feeling like they’ve waded deep into the weeds. How are you supposed to gauge the current success of your show? What is the benchmark for analyzing performance? It’s the dawn of a new era, my friends. There is a tool designed to simplify the process of evaluating and understanding your post-show data and members of IAEE have access to all of this data for free. All you need is your username and password. It’s the Event Performance Analyzer (EPA), the latest innovation from the Center for Exhibition Industry Research (CEIR) -a powerhouse that compiles all of the latest exhibition research- that shows how your event stacks up against CEIR metrics. I won’t spend time going over the methodology of why it works and how the data is collected but feel free to geek out by perusing the 2018 index report found here. Complete these three steps and have your calculations done for you. 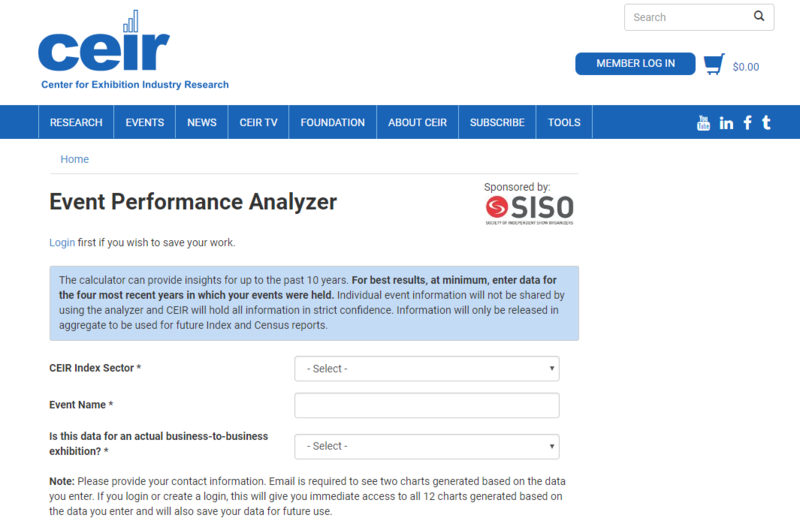 Go to the CEIR website, Login and then find the Event Performance Analyzer under the Tools heading. Input all the data you collected into the proper fields and voila you get the calculations you need to measure your success. Create new sponsorships. You have the data to back up your success claims so use it. Sponsors love statistics that offer proof that they can expect to get a good ROI for sponsoring your show. Bigger show space. If the attendance numbers indicate that you can take on a bigger space next year, go for it! Increasing fees. You’ve made a name for yourself and you have the hard data to back up your success. Don’t be shy about increasing fees to account for the extra space and staff to accommodate your growing show. Learn from it. Whether the data indicates success or a slump (it happens to the best of us) use it to learn from what worked and what was a miss. View it as an opportunity to make your show better next time. Show managers face intense pressure to be successful and having critical data in your hand can help you be more confident going forward. The Event Performance Analyzer takes some of that pressure off and makes your job a little easier, which is something we can all get behind. Betsy Jacoby-Greenleaf is the president of Jacoby Expo & Events where she specializes in strategic event growth and efficient event production. By developing both personal and professional relationships with show managers and as well as service contractors, Betsy and her team develop a tailor-made action plan for each event based on their specific goals, target demographics and forecasted industry trends. She currently serves on the board for the Mid-South Chapter for IAEE and is the Chair for the chapter’s membership committee. “When it comes to your business, it’s OK to simplify things.” Read how Betsy Jacoby-Greenleaf of JacobyExpo uses the Event Performance Analyzer to organize her data and make her job as a show organizer easier.